Do you struggle to get a good night’s sleep? You are not alone. Millions of people lie awake at night tossing and turning with too many thoughts running through their heads. If this sounds like you, I have some easy ways to help you get the sleep you deserve with essential oils. I fall into the second category. It’s pretty annoying to wake up at 2 AM unable to fall back into the sleep that my body desires. Where do you fit with your sleep pattern? I am a firm believer in getting my 8 hours of a solid sleep. I call it my “beauty sleep” but really it simply contributes to having a happy, healthy and productive day! I turned to essential oils for sleep when all else failed and I’m excited to share my solution with you! Always looking to holistic and natural solutions, I found essential oils and decided to try them for sleep. Prescription medications are not my thing. I also needed to find a natural method to help me sleep that wouldn’t give me an adverse reaction. My body is so sensitive to everything under the sun and I couldn’t risk yet another weird reaction. Essential oils are very concentrated liquids made from a plant’s chemical properties. An oil is “essential” in the sense that it contains the “essence of” the plant’s fragrance—the characteristic fragrance of the plant from which it is derived. I was excited to learn that essential oils have been used for thousands of years throughout history for medicinal purposes. The chemical composition of each essential oil determines its scent, absorption and the effect it has on our body. Each essential oil is unique in the specific benefits they provide. And today, let’s talk about how to use these brilliant essential oils to get some sleep! Before I go into the specific essential oils that I use for sleep, let’s talk about how to use them. You have a few choices and today I am sharing my favorite 5 ways. Cotton Ball. Put a few drops of your essential oil on a cotton ball. Take a huge whiff to inhale the aromatic scent and then place it next to your pillow. This is a fast and easy way to get the benefits of an essential oil during sleep. Diffusing. If you have a diffuser, place it next to your bed before sleep. They are pretty simple to use. Just fill with water, add a few drops of essential oil and turn it on. The aroma will fill your room for a few hours as you go off to sleepy land. The first time I used a diffuser with Lavender oil, I was off to sleep and didn’t wake up until morning. That was a major score for me and my favorite way to use essential oils. Bath. Sometimes you just need to relax! Take a nice warm bath with a few drops of essential oils for sleep and you may just fall asleep in the bathtub! Topically. You can apply certain essential oils topically on their own, called neat. Or you can use a carrier oils such a coconut oil or almond oil. Rub the oils on the bottom of your feet, temples and back of your neck. This does the trick for me every time! Spray bedding. Get a small glass spray bottle. Fill it with water or a carrier oil and then add a few drops of your favorite essential oils for sleep. Spray on your bedding before sleep. Which Essential Oils are best for Sleep? 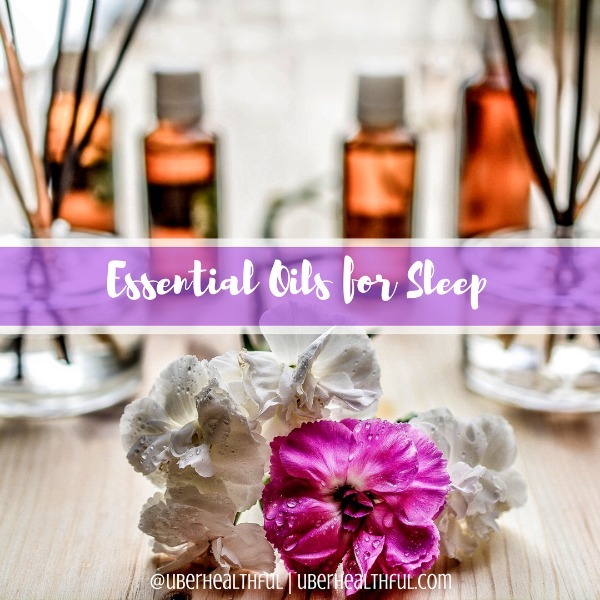 Now that you learned about what essential oils are and how to use them, here’s my top 5 essential oils for sleep. Keep in mind that exactly what works for me, may or may not work for you. Be experimental so you can find the best fit for your good night’s sleep! 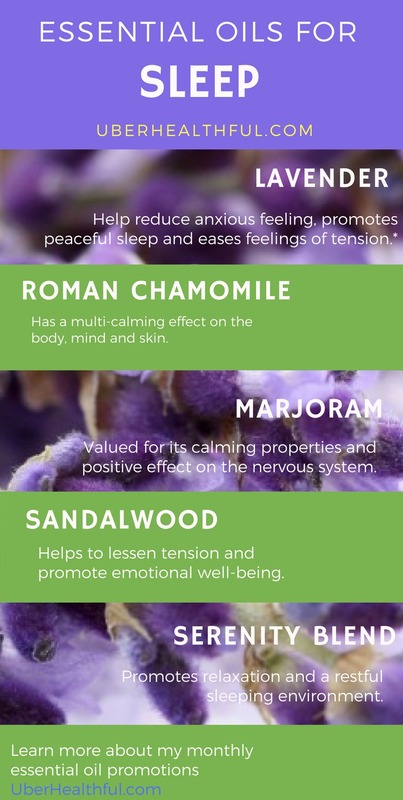 Lavender essential oil has so many useful qualities. The most well-known of these is promoting a good night’s sleep. I always have more bottles of Lavender essential oils than any others! The aroma is beautiful and it’s my greatest help in getting the sleep I need to stay healthy and happy! Learn more about Lavender and how to use it. Have you ever drank Chamomile tea and had that relaxing feeling come over you? Roman Chamomile essential oil has a multi-calming effect on the body, mind and skin. I feel perfectly safe using it even with my sensitive skin issues. Marjoram essential oil has many uses but for me, the most important of these is its calming properties and positive effect on the nervous system. When your brain won’t shut down and you feel like pacing the floor in the middle of night, grab some Marjoram oil and use one of the aforementioned methods to get your sleep on! Delivering a variety of benefits, Sandalwood essential oil helps to smooth skin and enhance moods by lessening tension and promoting emotional well-being. After-all, when we cannot sleep, our emotional well-being is not so well. Sandalwood can help! Imagine an aroma that is both calming and relaxing as you drift off to sleep. That is Serenity blend. It has a beautiful and perfect combination of these soothing essential oils: Lavender Flower, Sweet Marjoram Leaf, Roman Chamomile Flower, Ylang Ylang Flower, Hawaiian Sandalwood essential oils and Vanilla Bean Absolute. This is your go-to essential oil blend to help reduce stress and get a restful night sleep! If you’ve tried everything to get a good night’s sleep, it’s time you take a look at essential oils as a natural solution. I wish I had known about them sooner *sigh*. With so many ways to use essential oils, you’ll find the perfect method that works well for you. And the unforgettable aromas of essential oils are simply divine! You’ll be off to sleepyland in no time. For more information about essential oils for sleep, download my free eBook here.